Happy New Year’s Eve Friends! I hope all of you have a safe and Happy New Year! The Lord has promised to answer our prayers and sometimes that answer may be "no", "yes" or "wait" and even though we may not understand the reason for the answer here on earth, we have to trust in the Lord. We have put our trust and faith in Him and pray that you have as well. This evening I wanted to share another card that I designed using the December 2016 Our Daily Bread Designs Release stamp set, Handle with Prayer and ODBD Praying Border Die along with other previously released ODBD Dies and ODBD Paper. 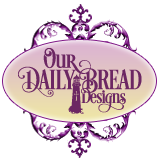 If you have not had a chance to visit the ODBD Blog yet or the Word Art Wednesday Challenge site, I would encourage you to do so- gorgeous inspiration from all of my Sister ODBD "Breadsticks" as well as the Word Art Wednesday gallery! 1). Ink the hand image from ODBD Handle with Prayer using black archival ink, stamp onto a piece of vellum cardstock and carefully heat set with a heat tool. 2). Color the ODBD Handle with Prayer image from the underside using water-based markers, allow the ink to dry and die cut with the ODBD Ovals Dies. 3). Die cut and emboss white cardstock with the following ODBD Dies- Praying Border Die, Bitty Blossoms Dies, Ornate Ovals Dies and Ovals Dies. 4). Die cut and emboss purple cardstock with the following ODBD Dies- Praying Border Die, Bitty Blossoms Dies and Ornate Ovals Dies (use the largest frame in the die set and cut two). 5). Die cut and emboss light green cardstock using the ODBD Bitty Blossoms Dies (leaves) and Lovely Leaves Dies. 6). Stamp the sentiment from ODBD Handle with Prayer stamp set using black archival ink onto white cardstock, heat set with a heat tool and die cut/emboss with the ODBD Pierced Rectangles Dies. 7). Cut pieces of purple cardstock to cover the ODBD Side Step Fancy & Fun Folds card base, add pieces of the purple pattern paper from the ODBD ChristmasCard Collection 2016 Paper Pad. 8). Layer the stamped vellum ODBD Handle with Prayer image onto the white oval die cut from step #3, layer the white die cut/embossed ODBD Ornate Ovals die cut frame over the image and mount onto the purple ODBD Ornate Ovals Die cut frame. 9). Add the layered die cut frame onto the side step portion of the card base. 10). Finish off the card by adding the die cuts from the above steps- the layered ODBD Praying Border Die, Bitty Blossoms Dies and Lovely Leaves Dies along with the ODBD Handle with Prayer stamped/die cut sentiment and pearls to the flower centers. Happy New Year and thanks again for taking the time to visit!! May the Lord richly bless all of you in 2017 and may you seek His Guidance throughout the year. Such a beautiful card. I love how the praying hands stand out.